I saw a part of that match, was really urging England on. Hope they win the final. Springboks blast Pumas in the 36-12 encounter but definitely it wont be the same against England when they crush them 36-0 with injured Wilkinson in the sideline. The Robinson-Wilkinson pair is going to make the difference this time. Hoping for a competitive show. Cheers. No NZL and now no FRA ... so I guess RSA is the only way to go now ... BUMMER ! I was really surprised to see England beat France... again! The Bleus missed a great chance to finally win their first world cup! Now it's England or South Africa... it's quite unbelievable to see England reach the final again as they went constantly downhill since they won WC in 2003 and they are only ranked 7 now in international rugby. It won't be another 36-0 but I think South Africa will win and get their 2nd title after the famous one in 1995. 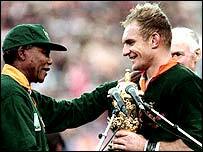 Last edited by Xavier; October 17, 2007 at 05:30 AM..
... Mandela congratulating South Africa captain Pienaar after WC1966 final. Lol... sorry, it was 1995... South Africa beat new Zealand 15-12 (after extra time) at Johannesburg, Ellis Park. I'm getting old and my memory's fading! That was quite a cool pic! Last edited by Sohel; October 18, 2007 at 08:06 AM..
Cant wait for the final. It'll be a good contest I think. Hurrah for TV5 Asie. Here is New Zealand captain David Kirk showing the cup won in the first edition of the WC in 1987. The All Blacks were showing at the time there was a reason for them to be considered the legends of rugby as they dominated the tournament, easily beating any opponent... who could have thought they were not going to win it anymore for 20 years and counting! just search for "rugby world cup 19.." and you'll have plenty of pages to see! About the final... I will support South Africa... having England winning 2 world cups in a row would be annoying! And I think the Springboks will win... unless England defense will stop Habana and co. and Wilkinson will keep on scoring kicks! Like you Xavier, I am supporting the Boks as well. Never have been a fan of England. Although what I like about present day rugby is that the Boks, Wallabies, Lions and France all have their days and go past the All Blacks. Its more evenly matched than say Australia in world cricket. As an Englishman this really doesn't feel like the 2003 RWC, then I was absolutely euphoric, now I am just surprised we got so far. Maybe I will feel differant if we win tomorrow! In any case I hope it is an exciting match with Robinson scoring the winning try. If England just kick every ball that comes their way then to be honest I can understand why neutrals won't support us. I'm watching on Alfa TV, it's quit decent. Saf-Eng 9-6, a try not conceded to England at the start of 2st half. South Africa wins the world cup 15 - 6. All points scored from penalty not a single try as a neutral watcher it was not interesting. South African defence was solid. well technically england did score a try, but stupid umpire was blind. To be fair, that try was not as certain as it first looks, once you have watched the replay about 20 times! Pretty mediocre final with no trys, dissapointed with both sides tactics. Great tournament though. this final game was dissapointing. Even, but unexciting contest on the field, and all the penalties were annoying. That break for a try really caught the Springbok's back line off-guard though. Good world cup nonetheless. One thing is clear: Australia, England, South Africa, New Zealand, France, and Argentina are the only teams that can ever lift any future WC title. Other nations in IRB seem to be too weak for this contention. Ireland were quite strong and were really close to win Six Nations earlier this year, but have been quite disappointing at the WC. The final has been quite disappointing too, no tries, only kicks and physical game... hope rugby does not turn to be only about that. 2011 edition will be played in New Zealand and if the All Blacks miss winning the trophy again I guess this time they will definitely quit this sport! another loss by England...they seem to be losing a lot..
South Africas defence was solid..maybe next time..
this final was dirty.. was watching the rerun of the first 20 minutes on TV5 (they're still showing the game now). As for competitive teams... Ireland and Scotland have a decent shot at becoming great too. If Argentina's there, why not these? I'm impressed with Georgia and Namibia's efforts too, but they've got a long way to go. Tonga, Fiji and Samoa are competitive in games between themselves too. TV5 rules ... as a former anti-apartheid activist in college and beyond, it was great to see RSA players, especially the White Aftrikaaners like Smit, singing "Nkosi Sikelel' iAfrika" with genuine emotion and pride. Great defensive show from South Africa.